You don’t have to pay top dollar for consumer beauty products to get great results. It turns out that many of the ingredients that you need to create comparable products may already be in your kitchen. Take a look at the list below and give these products a try if you have the supplies available. You may find a wallet friendly alternative to some of your favorite products; or, at the very least, a valuable new addition to your beauty routine. If you have never used coconut oil while shaving your legs or under arms, it is time to give it a shot. Coconut oil is more affordable than conventional shaving creams and lotions and it does not contain any of the chemicals. It also smells great, is antimicrobial, and naturally soothes and hydrates the skin. There are many different household ingredients that you can use to create an effective facial scrub. I am going to focus on one of the easiest; all you will need is oatmeal and water! You start by grabbing a handful of oatmeal and squeezing it in a tight fist. Run warm water over your closed fist so you slightly dampen the oatmeal. Simply scrub your face with the dampened oatmeal and proceed to wash your face as normal. An oatmeal facial scrub has been shown to be a great method for clearing troublesome skin. If you are not a fan of bananas, you will not like this mask! 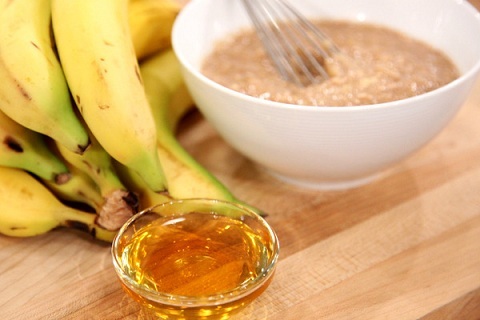 To make this facial mask you will need to smash one banana and mix it with 3 tbs. of honey. Apply the banana/honey combo to your face and leave it for five to ten minutes before rinsing. This mask is especially useful if you suffer some problematic oily skin on your face. Combining sugar with olive oil creates a great exfoliator for your skin. Take 1 tbs. of sugar and add a few drops of olive oil to create a healthy and natural exfoliator that will make your skin soft and smooth. The deep conditioning treatment is meant to be left on your hair for longer than commercial products so it can better coat and penetrate your hair shaft. It involves more ingredients than the previous “products” mentioned above but is still a simple process. Combine a half of an avocado (mashed), a tbs. of yogurt, and one egg yolk into a bowl and stir thoroughly. Use 1 tbs. of oil (olive, coconut, or shea) to moisten the mixture as you are stirring. Take your time when working the conditioner into your hair. Once the conditioner is applied, cover your hair with a shower cap or plastic bag and wait 10 or 20 minutes. Rinse the conditioner and wash your hair with your normal shampoo. You hair will come out shiny and smooth to the touch. To treat dry skin, ingredients with moisturizing benefits are a must. Yogurt, yolk, and coconut oil are a winning combination when it comes to creating your own facial mask. Mix 2 tbs. of yogurt, 1 egg yolk, and a few drops of coconut oil into a bowl. Use a cotton ball to apply the mixture to your face while being sure to avoid your eyes. Leave on the mask for around 15 minutes and then wash it off with warm water. After washing with warm water splash your face with some cool water. You will be able to feel the moisturizing benefits of this mask immediately. What are you waiting for? Create some of these homemade beauty remedies and let us know if they work for you! And remember, if you are looking for more traditional hair and skin care, your friends at Threads are always here to help.